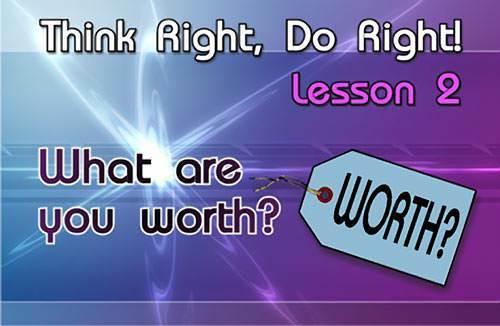 Lesson 2: What are You Worth? a) the feeling that they are as good as other people. b) the feeling that they are not as good as other people. b) not having as much money as they have. 3. Wrong thoughts don't have any bad effect on us. a) being a Christian and doing what God wants you to do. b) having good looks, being smart, and having a lot of money. b) only very important people. a) dress and act like your friends. a) His Son to die on the cross for us. b) an angel to die for us. a) forget about your problems. b) face your problems honestly and do something about them. a) to give them to the Lord Jesus. b) to worry about them all the time.